There is no escaping history in Poland. 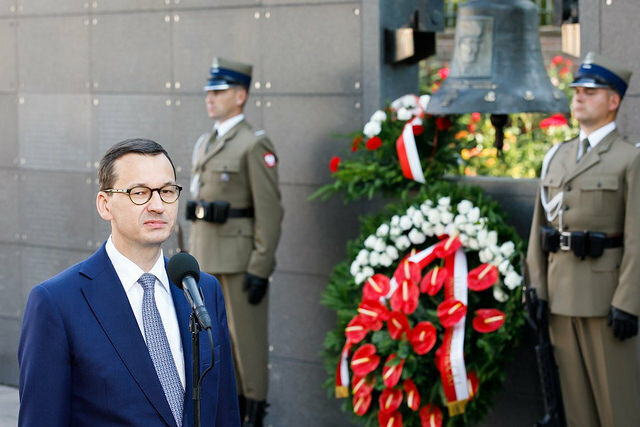 At an abruptly convened session in late June, the Polish Sejm (the lower house of parliament) rushed through an amendment to the Act on the Institute of National Remembrance, reversing another amendment that had been adopted  in January of this year. Effective immediately, attributing blame to Poland for World War II–era Nazi crimes would no longer be punishable by three years in prison. The ruling Law and Justice Party’s (PiS’s) rapid defanging of its own ‘memory law’ comes as no surprise. The original legislation invited international outrage, especially from Israel. Even US President Donald Trump—usually a close friend to Poland’s nationalists—indicated that he would not meet with Polish leaders until the crisis was resolved. Still, the way the Polish government went about tweaking the law was absurd. For one thing, the entire process was carried out in secret, to the point that Israeli–Polish relations were mediated by the countries’ respective intelligence agencies, lest the law’s key proponent, Polish Minister of Justice Zbigniew Ziobro, catch wind of what was in the works. Ziobro is Polish Prime Minister Mateusz Morawiecki’s main rival in the battle for influence with PiS Chairman Jarosław Kaczyński. So, when the new amendment passed, Morawiecki did not hesitate to take credit for salvaging Poland’s image. He and Israeli Prime Minister Benjamin Netanyahu signed a joint declaration  ending the dispute between their countries; and the Polish government purchased full-page ads in major newspapers around the world—including the three largest Israeli dailies—to promote the text of the statement. Yet, just when the Polish government seemed to have put its troubles behind it, Israel’s Holocaust remembrance centre, Yad Vashem, and its minister of education and diaspora affairs, Naftali Bennett, issued  sharp denunciations  of the joint declaration. As it happens, the push within Israel to condemn Poland’s memory law was launched by the Israeli opposition, and Netanyahu had only gone along with it because he had no other choice. In the event, Netanyahu—a fellow populist—was eager to resolve the conflict with the PiS government, because he did not want to alienate Israel’s most loyal ally within the European Union. This explains why the joint declaration is so emphatic about assigning culpability for Nazi death camps solely to Germans. Moreover, it even seems to suggest that the evil of anti-Polonism is somehow comparable in scale to that of anti-Semitism. Interestingly, while the Polish version of the statement admits of individual instances of ‘cruelty to Jews’ by Poles, the Hebrew version states that ‘we acknowledge and condemn every incident of cruelty’. But both versions then immediately go on to ‘remember heroic acts of numerous Poles, especially the Righteous Among the Nations, who risked their lives to save Jewish people’. This is invented history. As Bennett notes , while some Poles did help Jews, ‘these activities were few and not central’. Thus, the joint declaration incorrectly treats ‘the rare doers of kindness’ as a ‘common phenomenon’, and the ‘widespread events of [Poles] handing over [Jews]’ as ‘rarities’. Bennett’s characterisation is supported by thorough research, not least Night without an end: the fate of Jews in selected counties of occupied Poland , a two-volume history edited by Barbara Engelking and Jan Grabowski of the Polish Center for Holocaust Research. According to the book’s tally of nine German-occupied Polish counties, two-thirds of the 250,000 Jews who escaped during the Nazis’ ‘liquidation’ of Jewish ghettos in 1942 had been killed by 1945, most of them by Poles or with Polish participation. Of course, supporters of the joint statement would point out that Yad Vashem itself has recognised  more Poles (6,863) than any other nationality as the ‘Righteous Among the Nations’ who helped Jews. But this is pure casuistry. Poland was home to more than three million Jews before the war, and the Germans built their death camps on Polish territory. So, where else would the ‘Righteous Among the Nations’ come from if not Poland? None of this is to say that Poles are collectively worse or better than any other nationality. Indeed, Yale University historian Timothy D. Snyder , who could hardly be accused of harbouring anti-Polish sentiments, has concluded  that Poles behaved more or less the same as other people under similar circumstances. Sławomir Sierakowski, founder of the Krytyka Polityczna movement, is director of the Institute for Advanced Study in Warsaw and a fellow at the Robert Bosch Academy in Berlin. This article is presented in partnership with Project Syndicate © 2018. Image courtesy of the Polish Prime Minister’s Office on Flickr.